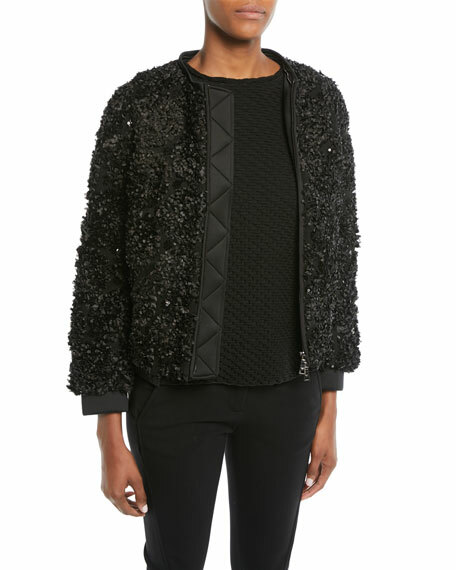 Emporio Armani embellished jacket with solid neoprene back. For in-store inquiries, use sku #2581587. Emporio Armani jacket in tweed. Stand collar; zip front. Half sleeves. Hip patch pockets. Boxy fit. Hem hits above hips. Emporio Armani jacket in tweed. Stand collar; zip front. Half sleeves. Hip patch pockets. Boxy fit. Hem hits above hips. Polyester/acrylic/nylon. Lining, polyester. Imported. Model's measurements: Height 5'10"/177cm, bust 33"/84cm, waist 25.6"/65.2cm, hips 35.8"/91cm, dress size US 2-4/FR 34-36. Emporio Armani "Chalk" jacket in satin. Crew neckline; double zip front. Long sleeves. Topper fit. Knee length. Cotton/silk. Lining, polyester/spandex. Emporio Armani "Chalk" jacket in satin. Crew neckline; double zip front. Long sleeves. Topper fit. Knee length. Cotton/silk. Lining, polyester/spandex. Imported. Model's measurements: Height 5'10"/177cm, bust 33"/84cm, waist 25.6"/65.2cm, hips 35.8"/91cm, dress size US 2-4/FR 34-36. 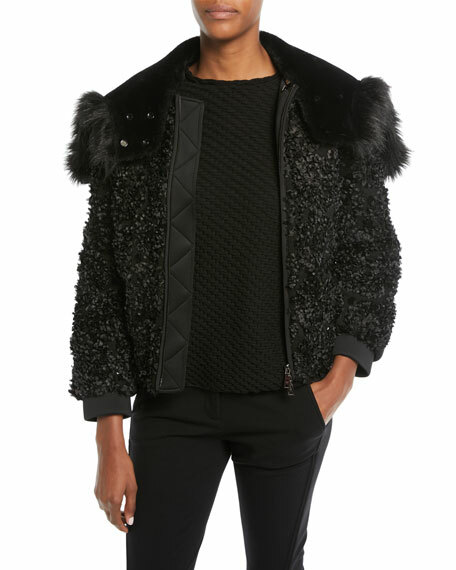 Emporio Armani jacket in dyed sheep shearling (Spain) fur with lamb suede cuffs. Round neckline; 2-way zip front. Long sleeves; zip cuffs. Semi-fitted. Cropped length. Lining, acetate/polyester. Details, polyester/silk/nylon. Imported. Model's measurements: Height 5'10"/177cm, bust 33"/84cm, waist 25.6"/65.2cm, hips 35.8"/91cm, dress size US 2-4/FR 34-36. Emporio Armani blazer in stretch cotton. Peak lapel; double-breasted button front. Long sleeves. Hip welt pockets. Straight hem. Cotton/spandex. Lining, viscose/cotton. Made in Romania.